Winner of the National Book Award, White Noise tells the story of Jack Gladney, his fourth wife, Babette, and four ultra­modern offspring as they navigate the rocky passages of family life to the background babble of brand-name consumerism. When an industrial accident unleashes an "airborne toxic event," a lethal black chemical cloud floats over their lives. The menacing cloud is a more urgent and visible version of the "white noise" engulfing the Gladneys-radio transmissions, sirens, microwaves, ultrasonic appliances, and TV murmurings-pulsing with life, yet suggesting something ominous. Don DeLillo published his first short story when he was twenty-three years old. He has since written twelve novels, including White Noise (1985) which won the National Book Award. It was followed by Libra (1988), his novel about the assassination of President Kennedy, and by Mao II, which won the PEN/Faulkner Award for Fiction. In 1997, he published the bestselling Underworld, and in 1999 he was awarded the Jerusalem Prize, given to a writer whose work expresses the theme of the freedom of the individual in society; he was the first American author to receive it. He is also a member of the American Academy of Arts and Letters. "One of the most ironic, intelligent, grimly funny voices to comment on life in present-day America . . . [White Noise] poses inescapable questions with consummate skill." 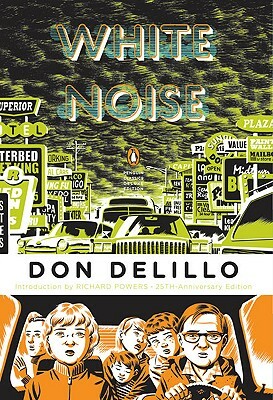 "DeLillo's eighth novel should win him wide recognition as one of the best American noveslists. . . . the homey comedy of White Noise invites us into a world we're glad to enter. Then the sinister buzz of implication makes the book unforgettably disturbing." "A stunning book . . . it is a novel of hairline prophecy, showing a desolate and all-too-believable future in the evidence of an all-too-recognizable present. . . . Through tenderness, wit, and a powerful irony, DeLillo has made every aspect of White Noise a moving picture of a disquiet we seem to share more and more." "It's brilliance is dark and sheathed. And probing. In White Noise, Don DeLillo takes a Geiger-counter reading of the American family, and comes up with ominous clicks." "A stunning performance from one of our most intelligent novelists . . . Tremendously funny."